These beautiful full box stickers of white crabapple blossoms are perfect for many types of planners including daily, weekly, and monthly planners! Makes a perfect Mother’s Day gift! 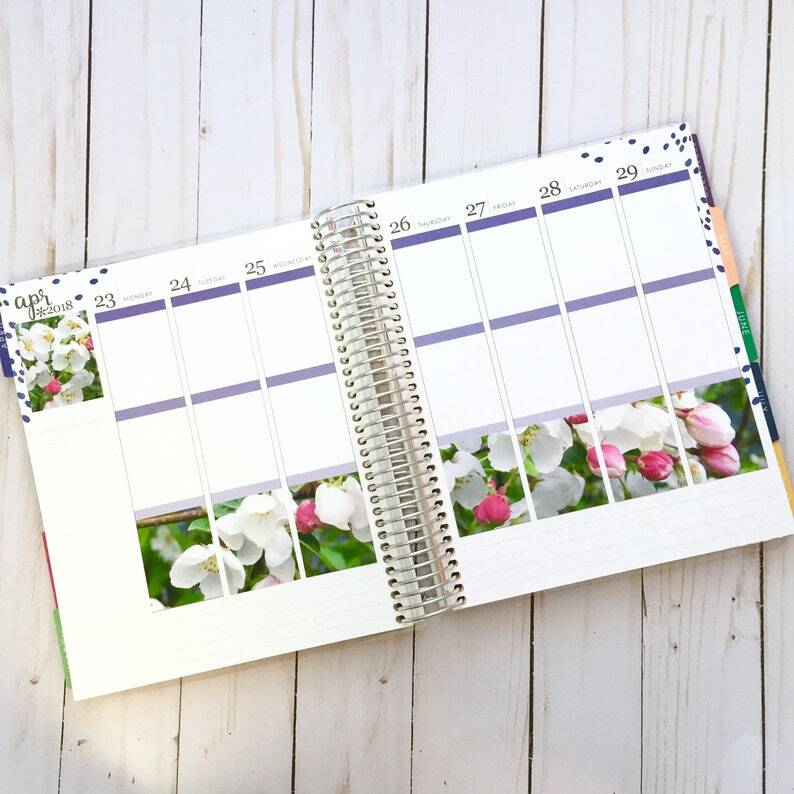 Stickers are shown in a colorful erin condren vertical planner. Stickers feature original photography by Elizabeth Nicholson. They are smooth, matte, vinyl, permanent, non-removable stickers. This type of vinyl can be written on with most pens! Sticker sheet is 7" wide by 4 1/2" high. Each full box is 1 1/2" x 1 9/10". Ink is vibrantly printed, but please keep in mind that color may vary from one screen to the next and from screen to printer. Sticker sheet only. Pens, planner, or other items are not included. These are the perfect peppermint planner stickers. Thank you so much! My barn stickers are absolutely beautiful! Far exceeded my expectations! Thank you for the Nest Stickers as well! Gorgeous! Payment is through the usual means offered by Etsy. We want you to be thrilled with your purchase. Any prints or other physical items that do not meet with your approval within three days of receipt can be returned for a refund of your money (minus shipping expenses) as long as the item is returned within two weeks of purchase in perfect condition. We are not able to offer refunds on digitally downloadable items, but we will work with you to try and resolve any issues that you may have. We are a family business wanting to practice the Golden Rule. Shipping is usually by USPS, but we may use UPS from time to time depending on the item shipped. Copyright of original images always remains with the photographer, Elizabeth Nicholson. Please do not make unauthorized copies of my work to re-sell. My family and I thank you!